Fisher-Price introduced Chunky Little People in 1991 in response to a safety issue over the Original Little People. If the Original Little People figures were taken apart, the smaller pieces could be swallowed by little children. Rare as the case was....especially considering the Little People line began in 1959 and lasted until 1990...Fisher-Price changed the design of the Little People into what we now know as Chunkies. The first chunky sets were basically carry-overs from the Original Little People sets, such as the Garage and the Barn. The difference was that the sets seemed very clumsy with their exaggerated features and accessories. Nevertheless, Fisher-Price pressed on and continued to manufacture the Chunky sets until 1996. Click here for a list of all known Chunky Little People sets made in order by model number. 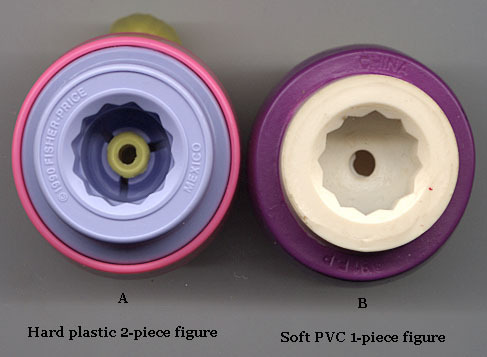 The hard plastic figures are made as two separate pieces (head and body), and can be easily identified by the captured peg or plastic "tenon shaft" that is visible from the underside of the figure, inside the body cavity. This is very similar to the design style of the original Little People figures. These hard-plastic material figures have their color cast as part of the material itself (the color goes through and through the plastic). The softer PVC material characters are made as one unit; the entire body and head section are cast as one piece and are not (nor ever were) separable. You can easily identify these figures by the lack of a shaft inside the body cavity; instead, all you see is a small round hole that extends into the head of the figure. PVC people have their colors applied to the outside of the material, and because of this process, tend to be much more colorful and detailed in appearance (such as the Hamburglar, etc.). 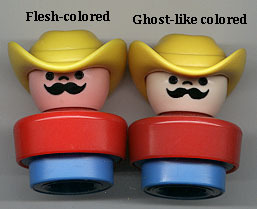 Finally, be aware that although most Chunky figures that represent Causasian people are flesh or peach-colored, it is not unusual to find....just like in the original Little People line....some figures who lack the standard skin coloration and are "ghost-like" in tone. Click here for an example. In 1997, Fisher-Price made a startling change as they replaced the Chunky figures for squeezable plastic figures with arms. Will the changes continue? Only time will tell.